Hi I returned last Saturday to the Santa Fe Farmers Market with a few boxes. Starting tomorrow (Sat Sept 9), I will be there from 7 am-1 pm throughout the rest of the tomato season. The tomatoes are starting to come in now after a long wait. Don’t wait too long to come to my booth as I will run out before the end of the market. I am located INSIDE THE BUILDING. Just look UP for my ‘Tomato Lady’ sign above my booth. The market people may be moving me around a little inside the building so be sure to look around to see the sign. I have many new great varieties and of course my favorites I bring like Paul Robeson, Purple Cherokee, Sun Gold, Costuluto Genevese, Pink Berkley Tie Dye and more. Over 20 varieties grown this season from all over the world. And of course I will have some Shishito peppers, and small eggplants as well. This is my last season at the market so be sure to come by and say hi and pick up a few. Today was a good day! 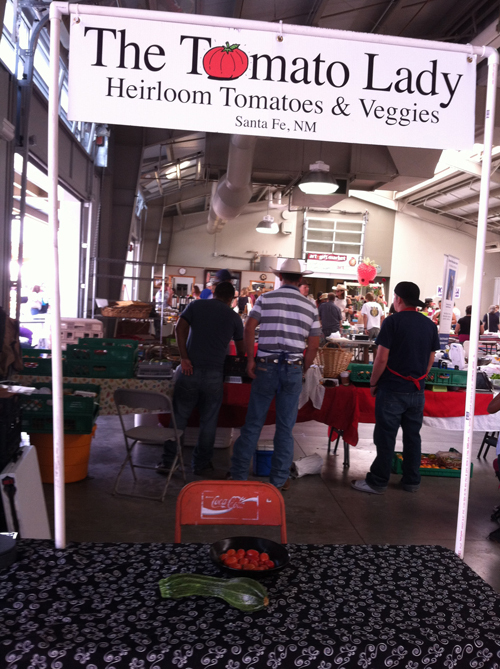 First day back as The Tomato Lady’ at the Santa Fe Farmers market sold out. A great big thank you to all my patrons who waited for my tomatoes to ripen! Many thanks! Only a handful of tomatoes and 1 zucchini left. Behind my table are some other vendors at their tables. See you next week! 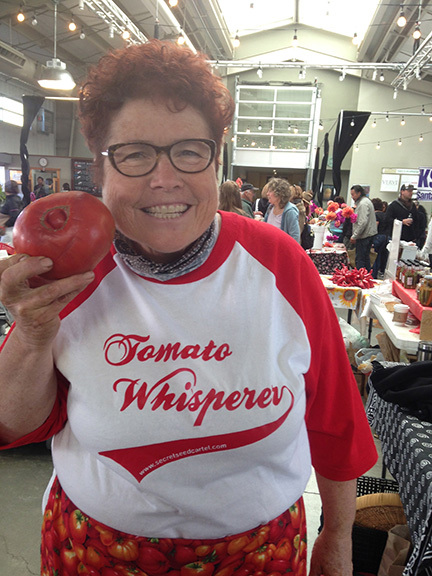 Tomorrow, Saturday, August 25, I am returning to the Santa Fe Farmers Market as ‘The Tomato Lady’. 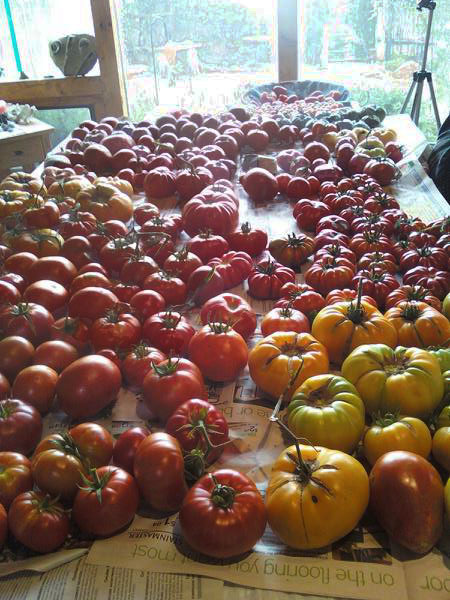 At this time I have over 15 varieties of organically grown heirloom tomatoes from luscious black tomatoes like Purple Cherokee, supersweet yellow Virginia Sweets to Italian Red Costoluto Genevese and many, many more . 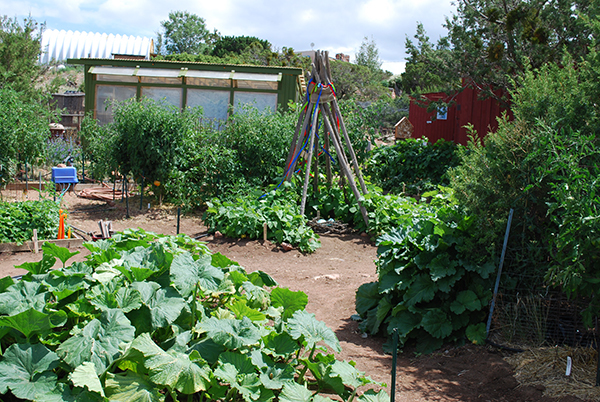 I have over 50 plants and 25 varieties that will ripen as we go through the season. They are beautiful. They are gorgeous! And they taste wonderful! Magnifico! I also have Shishito peppers, Costata Romanesco zucchini and Fairy eggplants that I will sell as well. Next week I will add some sunflowers out of my sunflower forest and Emerite French filet beans. I’ll be inside the building-look for ‘The Tomato Lady’ sign above my booth. Hours are 7am-noon. Hope to see you there!